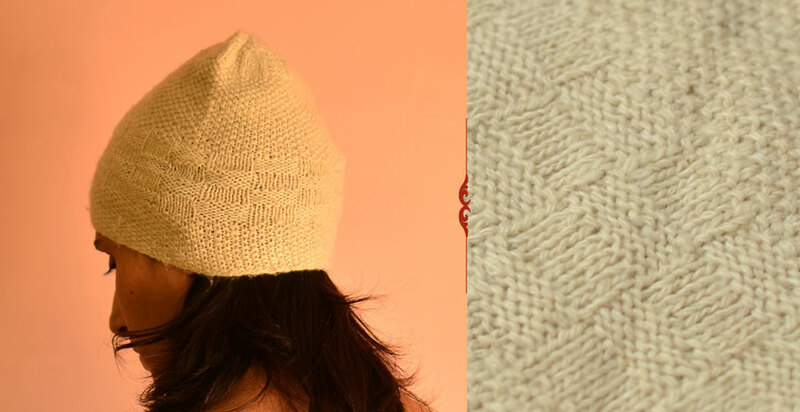 About Product : The mountain hears the winter coming, ready to sweep everyone off their feet with bundles of the wintry whisk it carries... while the women knits the yarn singing soulful melodies in peace, filling it with a whooping warmth & love for the winters to see! 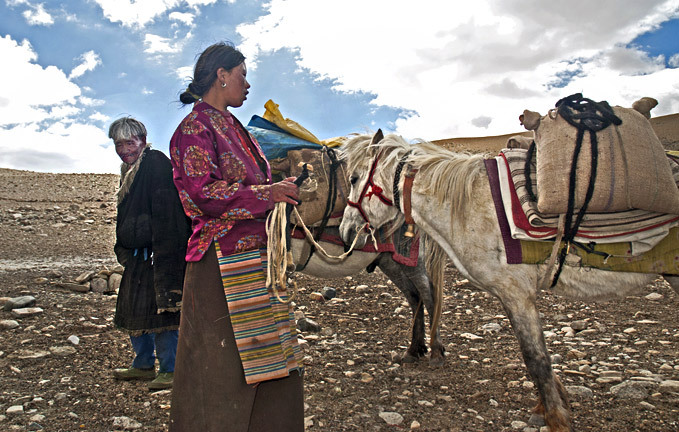 The Changpas of Ladakh consist of four tribes further divided into fourteen groups, with an average of 130 families per group. The four tribes are the Kharnakpas, the Rupshupas, the Korzokpas and the Anghoams, all traversing in their defined territories. 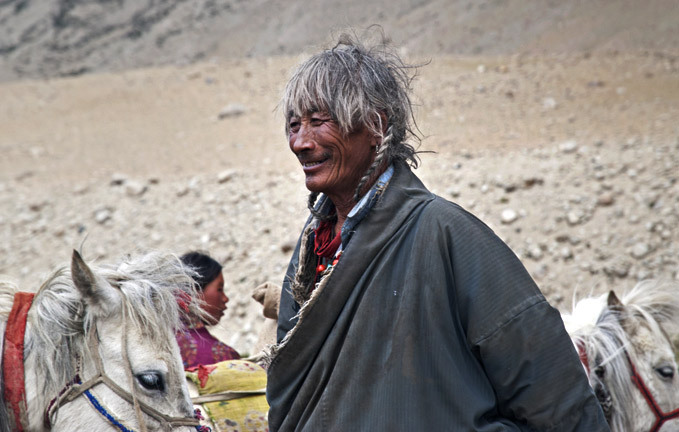 All of Changpas’ lives and livelihood revolves around their livestock and they believe them to be sacred beings bestowed upon them by the gods. Changpas see themselves simply as Tibetan Buddhists; their beliefs seem to incorporate many forms and shades of Buddhism and they visibly travel on a different spiritual plane, but still, Buddhism practiced by the nomads has a duality to allow its followers both; to believe in inner spiritual way of living and to fear a vengeful god if one strays… maybe their nomadic way of life demands so. With each family owning over 200 of livestock they need a certain kind of order.The best animals are dedicated to particular gods. 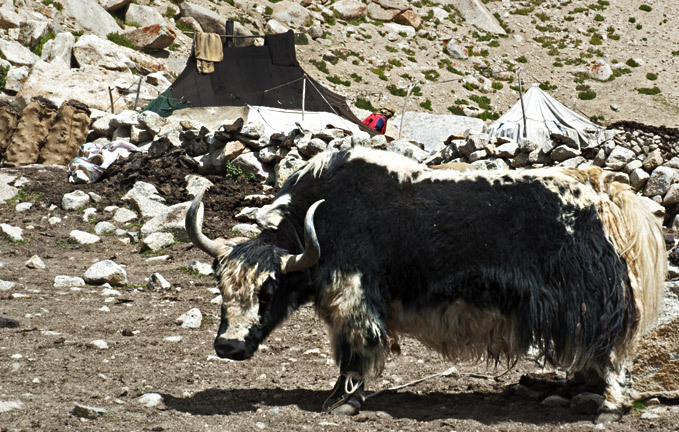 These chosen sheep, goats, yaks, Dimos and horses have to be a particular color, well proportioned, strong and in good health. These animals are regarded as auspicious and are exempted from hard work, kept clean and fed well and are not to be killed or sold for meat. Weaving and its related tasks are what keep almost all the tribes’ men occupied… children included…. Women with good weaving skills apart from winning respect from their peer also get many suitors as husbands. 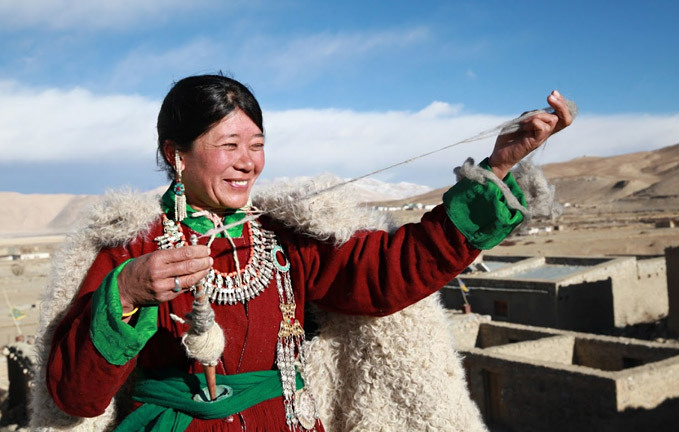 Weaving runs deep into the Changpa social fabric and literally defines a woman’s status.Summer is when the wool is sheared, as they say the hair rises above the surface of their skin and is no longer a winter coat tightly gripping their body. A ceremony is held to begin the process and fleece is sheared in parts, to allow the animal adjust to the climate comfortably. After shearing, the wool is beaten repeatedly with a narrow stick, which softens and fluffs up the fibers, after cleaning of dirt and debris it is spun using a small portable drop spindle. This natural fiber is used to make Rebo, Namboo, Patu, floor covers, caps, socks, saddles, bags and blankets.Women sit on the ground to use their back harness looms. To keep the warp under tension they push their back and legs against a large planted rock. The loom gives hard work to the body but has an advantage of being portable. Although each gender works only on their defined specialty, either male or female ably handle the tailoring and final stitching of the material into a finished product. Only men weave Rebo using a fixed-heddle loom and it takes two men a year to make one. The coarse outer yak hair in a wide variety of dark shades is accumulated. Most of the hair is dark brown but varies from charcoal to raw umber to deep sepia to rich mocha. The hair is sheared, washed, beaten, spun and twisted and then woven coarsely, tailored and assembled by the way of stitching thin panels together. 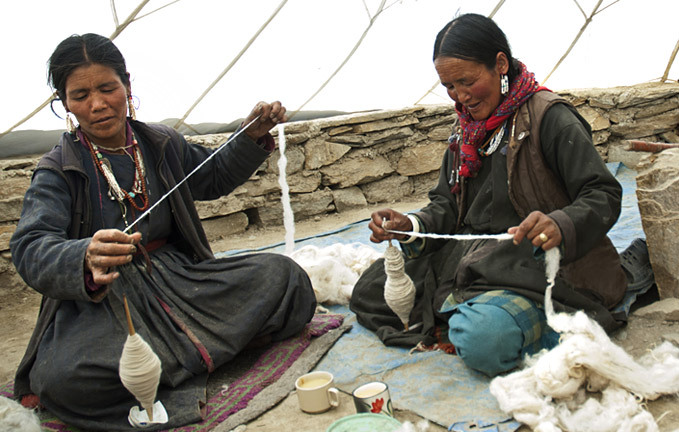 Tough woven ropes are braided using Yak hair and then sewn into the fabric at specific spots to allow pulling of tent’s slant walls. Men always weave their own saddle, blankets and bags. For they only use light, natural fiber from goat together with the dark fiber from Yak. Each man in the tribe has his own individual design pattern that he weaves into all of his blankets and saddlebags. Like a barcode, it is woven in a series of dark and light bands of varying widths. 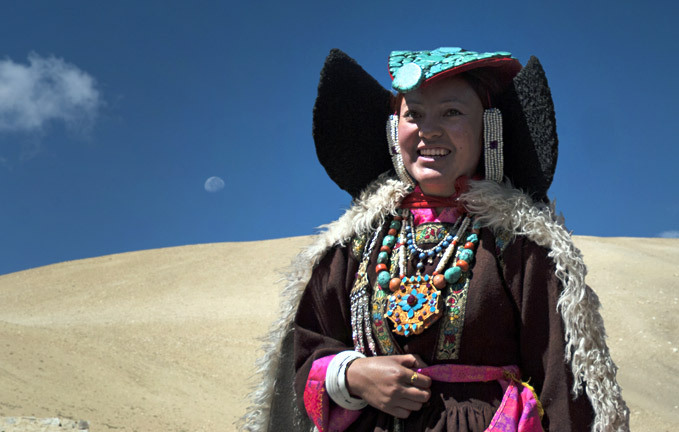 Each Changpa parent passes their particular design down to their eldest son or daughter, who in turn passes the design on to the next generation. Thereafter the father has to come up with a new woven design for his blankets and bags, which is a variation of the original.Women are the exclusive weavers of nomad clothing and woven fabric is usually dyed red or a shade of maroon. 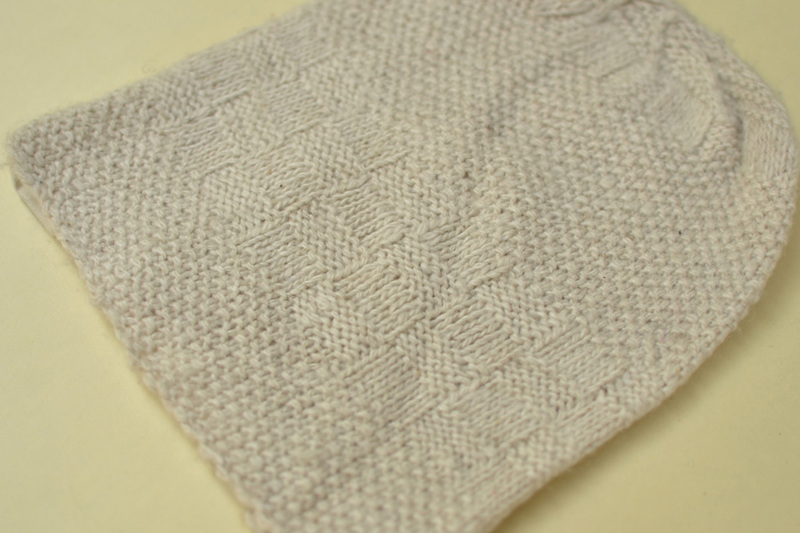 Women, regardless of age, are never seen in undyed clothes. The most constant aspect of Changpa clothing is their long maroon robe called the Goncha. It is worn by both women and men and is accompanied by a colorful sash tied around their waist. The woman’s robe flares below the waist with small pleats. Another distinctive part of women clothing is a blanket worn around the shoulders, like a cape. 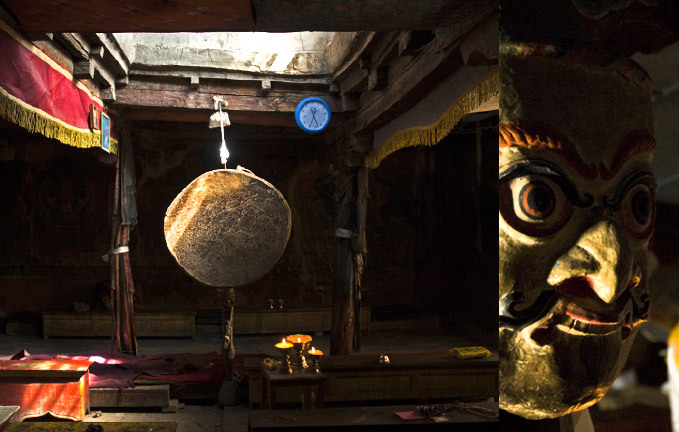 It is called a Yogar and is made from sheepskin worn with the wool side next to the body. The outer side is usually covered with a green fabric and accented with bold blocks of red. The Yogar was designed to give the wearer warmth, cushioning for the back from the weight of heavy loads and a carrying pouch for babies. 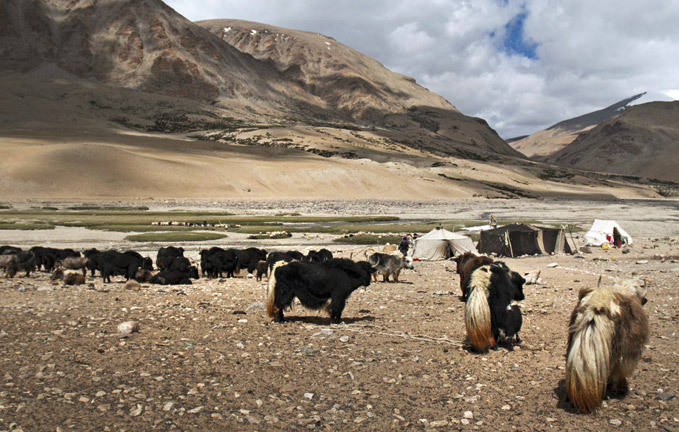 Survival for the Changpa is based on wild vegetation, the sole source of food for their large herds of livestock. Each day is predominantly designed around feeding and caring for their animals round the year. 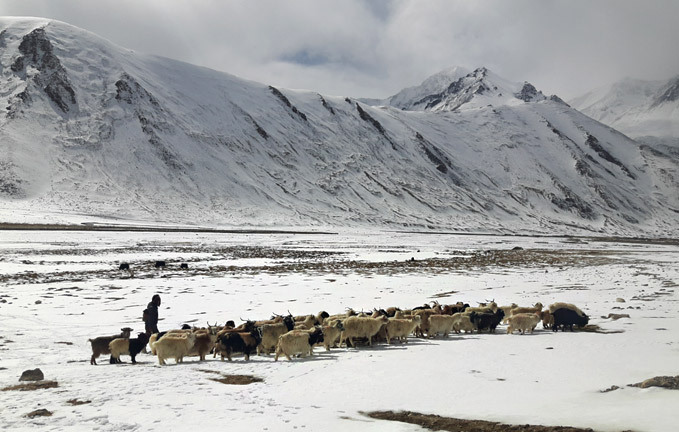 In blistering heat, in blizzards, in freezing temperatures and in driving rain, their daily duty remains the same, to take the family flock of about two hundred animals to distant wild pastures and guide them safely back home.Goats have rapidly increased in number and in importance to the Changpa. 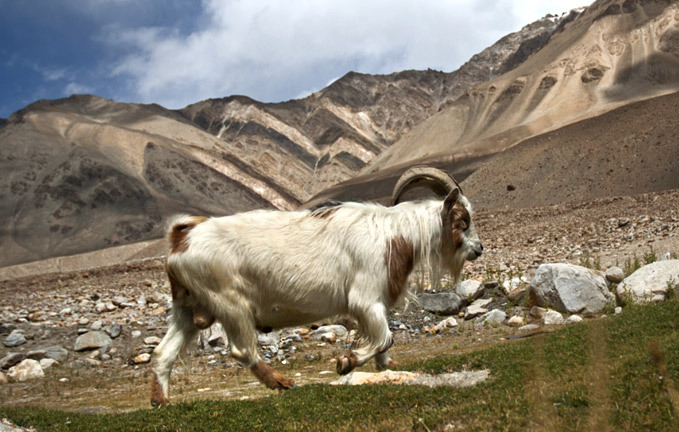 They are regarded as being better able than sheep to adapt to a cold mountain environment, but their increasing status among Changpa has been actually due to increasing demand for Pashm, the soft and silky inner fleece of the Tibetan mountain goat. This increase in demand could also be attributed to the closure of the border between Ladakh and western Tibet, stopping the supplies of Tibetan Pashm to Kashmir. 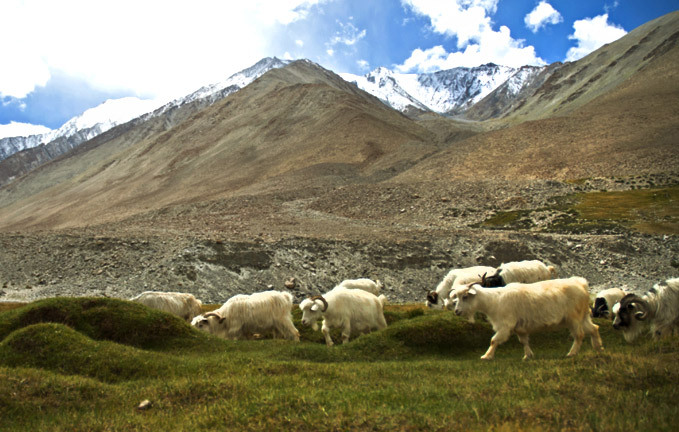 An approximate number of Pashmina goats kept by the Ladakhi Changpa as of today is about 170,600. The yarn spun from it is called Pashmina. This Pashmina is sold unprocessed to middlemen to be used by the weavers of Kashmir valley.A good deal of the Changpa economy is cashless, most of what they require is self generated. With so many animals, dairy products are plentiful and enjoyed… They make a lot of soft cheese, which is preserved for winter by drying in the sun. 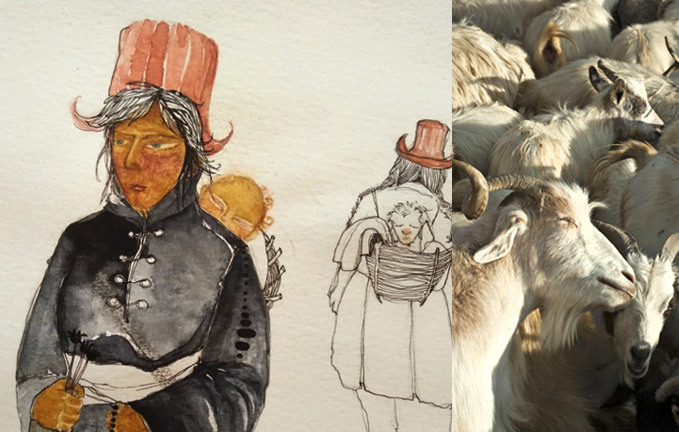 Tsampa and butter tea are the nutritional cornerstones of all the mountain people of Ladakh and also a limited amount of bread and potatoes are a part of their diet. When produce such as barley, rice and sugar are required, they usually barter or trade for it with Pashmina, bulk wool or animals. 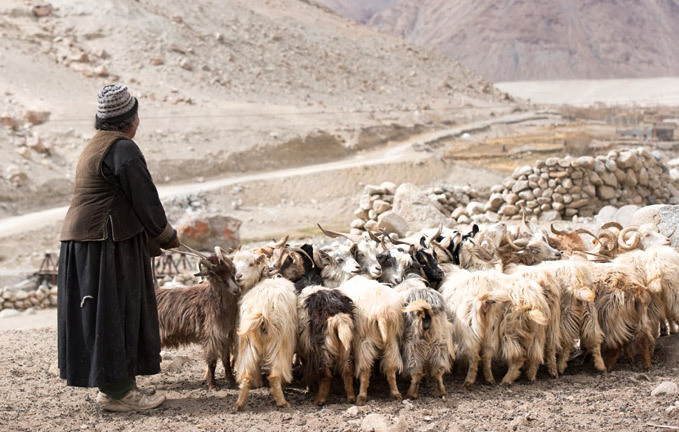 Larger cash sales occur when butchers come to Changtang to buy quantities of sheep and goats on the hoof. 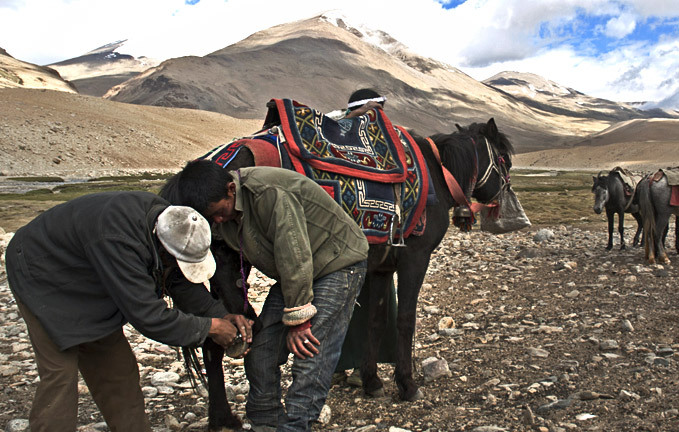 Changpa only sell their animals to control their heard size in order to sustain the resources at their disposal. Note ♦ The items in this category are non-refundable & non-returnable. ♦ The products in this category are handmade. ♦ These might slightly differ from as seen on digital screen. 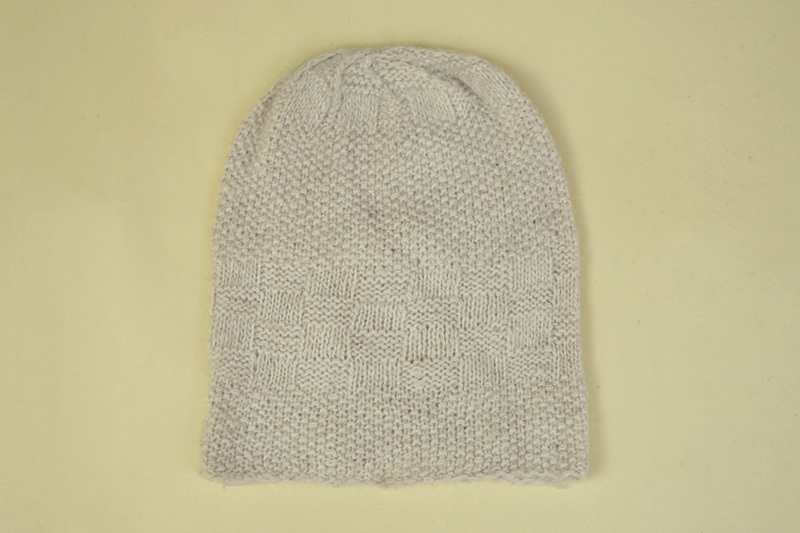 Product details This woolen product is soft & stretchable. Dimensions given above are without subjecting the product to any stretch. “Here’s a mountain we climbed, where a burnished pathway leads to nowhere but oneself… here’s a rive..